Dolphins are extremely intelligent and playful mammals of the sea. Ever fantasized about swimming alongside one? Now you can! 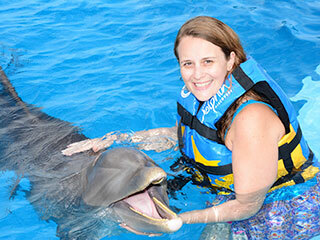 With our dolphin excursions, you have the special opportunity to interact with our marine friends! We have three excursion options in our multi-million gallon Dolphinarium and all levels of swimmers are welcome. Come enjoy an adventure like no other and create this once in a lifetime experience in Punta Cana. Embrace the kid inside us all and come play inside our large dolphin enclosure! Get the opportunity to touch these mammals and learn about their daily diet and other fun facts. 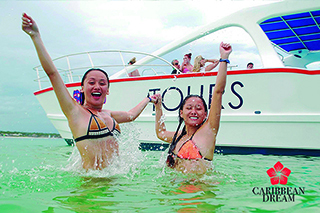 Get an intimate experience with the dolphin and great pictures to keep the memories forever! Jump into the Dolphinarium for an unforgettable experience! 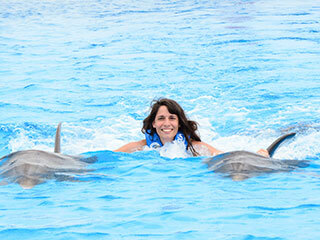 The Dolphin Royal option offers the most interaction with 2 dolphins instead of 1 and with a smaller group of people! 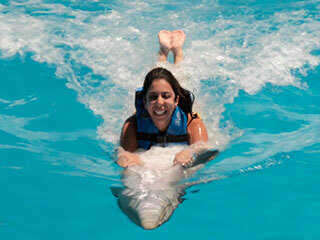 If you've ever dreamed of swimming with Dolphins, this is the most intimate and memorable experience in Punta Cana. This is a once in a lifetime chance to swim with Dolphins! Dance with the dolphin, shake hand to flipper, and other great activities. Our Dolphinarium is the perfect setting to make this a memorable experience for years to come.